Why the UAH global temperature is late | Watts Up With That? There has been a delay in our monthly processing of global temperature data from AMSU. An undersea telecommunications cable used to transmit about half of the huge volume of data coming from the Aqua satellite was cut in late November off the coast of the Netherlands, delaying receipt of that data. While there were redundant data transmission capabilities, apparently both failed. Also, John Christy and I have been on separate travels quite a bit lately (I spent 2 weeks in Miami after my daughter had an emergency C-section — I’m a grandpa!) and now I’m at the AGU in San Francisco, with a trip to DC early next week, so monitoring of the situation has been difficult. I have been working on a new diurnal drift correction for the UAH global temperature dataset, which will be released as Version 6 when it is finished. The orbital drift of most of the satellites carrying the AMSUs (and earlier MSUs) has been the largest source of uncertainty in getting long-term satellite temperature trends, and the correction for this drift has been a research topic for us off-and-on for many years. Fortunately, there has always been at least one satellite operating without significant drift, and so we have used those satellites as a “backbone”, or anchor, for the others. The Aqua satellite is the only one which has its orbit maintained with on-board propulsion, but channel 5 on the Aqua AMSU instrument has become increasingly noisy in recent years, so we anticipate at some point we will no longer be able to rely on it, thus the need for a new diurnal drift adjustment. I’m hopeful that the new procedure I’ve developed will work well, which is rather novel and is mostly insensitive to instrument calibration (see if you can figure out how that would work, wink-wink). The ultimate test will be the removal of long-term drift between simultaneously operating satellites, which also depends on season. It should allow us to get better regional temperature trends, land-vs-ocean trends, and remove some spurious season-dependent differences in temperature trends. The earliest Version 6 of the UAH dataset would be available is the early January update of the December temperature data. I thought Dr Mann had already worked that out. Congratulations on your new grandchild. Hope your drift adjustment works as well. The number of times I’d thought I had an operational problem licked and then had to pull back the code because there was something else going on as well…. Good Luck. Congratulations grandpa – I know that feeling having had the same (first) experience recently, C-section and all. Considering the satellite position problem, would it be helpful to have three existing or new satellites in a more distant orbit to use as reference points for those instruments bobbing around in lower orbit? Is the long term solution that simple? The faster-than-light neutrinos from CERN faced a similar issue, which is, where are the satellites, really? If that was in place your time could be better used sorting out the instrument issues. I really appreciate your efforts and look forward to a description of your prescription for drift (of all kinds). Thanks for the update. I turn on my computer each morning and look to see if there is an update of the Lower Troposphere temperature data and wait patiently. The Ap Index still remains jaw-droppingly low. The index was “5” last month. 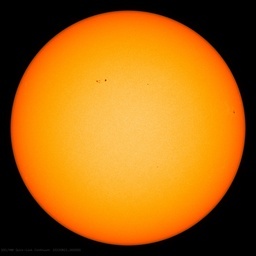 I wonder if Dave Archibald has released an update of his Solar Cycle 23 and 24 comparison graph. It might give us a feel on where this solar cycle is going. I have been too busy working on the historical weather chronology to do anything else at the moment. Next update is a week or two away and includes 200 additional pages of early U.S. weather data. I just got my hands on 2,000 years of Chinese weather event data but that will have to wait for a while. It is amazing how much historical weather data exists if only one looks for it. Congratulations on the new grandchild. data can be questioned in the future? RSS +0.033 º C …. are correct? Obviously a Dutch Captain dragging an anchor on his way to an oilfield! Congratulations by the way, my Grandson is now 3 and so much fun! is the RSS value 0.03C for November? Hopefully Telenor will get that cable fixed. BTW, when do you think you will be accessing NPP data – or will you be using it at all? It is the next satellite to have a controlled orbit crossing. Congratulations, gramps. Your genes improve the global pool so I hope this is the first of many. Surely the cause of the communications failure is somehow due to CO2 emission from fossil fuel combustion, right? Triangulation. Use three (or more) adequately separated receivers at fixed positions on the ground and compare arrival times of the satellite transmission. That should get a pretty darn good position fix on virtually anything in orbit that’s got an active radio transmitter on it. Another way would be to leverage NASA’s space debris tracking programs to get a fix on the satellites. Those resources include radars and telescopes. It would probably be cheaper and easier though to triangulate on the transmitter with a few ground based receivers. Getting a super accurate timestamp for each receiver is a piece of cake with off the shelf hardware used in GPS receivers. In fact if the operating frequency and modulation technique for the climate satellite transmitters is similar to that employed by GPS satellites then it might be as easy as flashing some new firmware into an off the shelf GPS receiver and viola you got your ground based receiver so cheap you can scatter scores of them all over the world anywhere wherever there’s an internet connection for the receiver to use to ship its data to you. Thanks for all the congrats. Baby Noah was over 2 months early, 3 lbs 14 oz. Mother and baby are fine now. It looks like there is some confusion over what I mean by “drift”. (The orbits of the satellites are known quite precisely…that’s not the issue.) The problem is that atmospheric drag causes the orbits to slowly fall from their original sun synchronous altitude, which means they start measuring at a different local time. Since the day-night temperature cycle is so large, even a 30 minute drift in the observation time can cause a significant error in long-term trends, at least over land. Two of the satellites (NOAA-15 and NOAA-16) have drifted by several hours. Eventually we will get the ATMS temperature data from NPP, the newest non-drifting satellite. This is also why the ICSSP cloud dataset is a little dodgy for cloud trends…those are the same satellites, and it is difficult to remove the diurnal cycle in clouds in the data. (I spent 2 weeks in Miami after my daughter had an emergency C-section — I’m a grandpa!) – Frigging trumped again by Anthony must change my name to Mr Cliamte Scientist 🙂 I’m an Uncle, although my mum went with Nan, Grandpa. Heart felt congrates, although my poor little nephew is the spitting image of me at 1 month. That should be trilateration, not triangulation. Alan, Just wait until you are a Great Grandpa (with another on the way)! Ya know, its hard to not be paranoid about “accidental” cable cuts and the like these days. It seems that since cooling began and sea level stopped rising, there have been a number of satellite problems and the like. I’m not understanding your explanation of the problem. If the orbit is known precisely, and the drift is known, what is the challenge for correcting the data to show the proper position and the proper time stamp? Or is the problem that you know the satellites are drifting, but not by precisely how much? Given you listed the cause as atmospheric drag, should we assume that the drag is not consistant, so extrapolating the amount of drift over any given period of time would also be problematic then? “Congratulations Dr Spencer, The gene pool has been enriched. That being said, I am surprised that such an important dataset is so dependant on a single individual. Billions is spent on Climate change research, but on the four main actual temperature datasets it seems to be a shoe string operation. Frustrated. Get more funding. David, day is warmer than night, right? If the satellite slowly changes its local time of observation from a cooler to a warmer part of the day (or vice versa), then a spurious long-term trend can become apparent which is only due to the local time of observation increasing. BlueSky, we would love to have funding to do this, but as you might understand, funding agencies basically have us on their black list for not supporting alarmi. Duh. OK, brief feeling of stupidity passes over me…. ….then curiousity takes over. Very interested to see how you compensate for that! Congratulations and take time to look after the family. Proverbs 17;6 Children’s children are a crown to the aged, and parents are the pride of their children. You could calibrate the drift if you had a stable land based temp record which is sampled at th same time as your local rising. Except for when a major weather front comes through around rising, the local warming curve for any season should be fairly standard – so many degrees an hour. From this you could subtract out the drift. It all comes down to having a good ground reference set of points. I guess you could develop a current model of morning warming if there is not much historic data. And of course each region would have its own warming curve. I didn’t understand the drift problem either. So without active orbital correction you can’t make repeated measurements at the same time over the same place with the same satellite. You can make comparable measurements with different satellites but that then introduces a problem with MSU calibration differences between satellites. Congratulations grandpa! Best wishes to Noah and the family! I am wondering why it is that I don’t see on any climate blog site, including WUWT, the development of maxima and minima in tandem with the reported average temperatures on earth. Is this something the satellites cannot tell? Average temps. do not tell you anything at all. You have to see what it causing the average temps. to rise or fall. Any given satellite gets to “see” any given spot on earth once every 24 hours. But, it isn’t exactly 24 hours because of atmospheric drag, so it is 24 hours plus a few seconds. The satellite starts out taking the temp of a given spot on earth at 6:00 AM, and a few years later, that exact same satellite is taking the temp of the exact same spot at 9:00 AM. Three hours of daily temperature rise are now incorporated into the daily data that shouldn’t be there. So, the question in my mind is, do you have ANOTHER satellite that does NOW see that exact same spot at 6:00AM? If so, would it be possible to calculate the temperature differential between 6:00AM and 9:00AM of that specific spot and subtract it from the first satellite’s measurements? I’d think you’d still have a problem in the callibration differences between the two satellites, but you would still get a much more accurate number over all. There is a problem with temperature sensors, whether surface or satellite. Surface sensors only tell us the energy content of the air passing the sensor. Satellite sensors only tell us the energy content of the outgoing longwave radiation passing the satellite. Neither tell us anything about the Earth system energy content (not temperature). It is perfectly feasible for the Earth system to be gaining energy whilst the sensors show a low reading and losing energy whilst the sensors show a high reading. The reason for the potential discrepancy is variable energy retention by the oceans and variable solar energy into the oceans from variations in cloudiness and albedo. So far as I can tell nobody but nobody and certainly not the models has or have any idea of the net balance of energy flow at any given moment and none of our data services can tell us either. The nearest we have is the Argo system and that seems to be having difficulties. We are all just shooting in the dark. I suggest that the only way of knowing whether the Earth system is gaining energy or losing energy is to examine jet stream behaviour. The more jet stream zonality we observe the more likely it is that the system is gaining energy as during the late 20th century. The more jet stream meridionality we observe the more likely it is that the system is losing energy as from 2000 to date. Congrats on the addition to the family. VERY Glad to hear that all are doing well. Amazing what all those medical advances that came along with fossil fuels have accomplished ! I bet the hospital involved used lots of sterile plastic devices to help insure a good outcome. Although it sounds a little akin to the “The dog ate my undersea cable” excuse to me, Ha Ha Ha. Best wishes to all, And a Merry Christmas too…..
Changes in atmospheric temperature have a particular importance in climate research because climate models consistently predict a distinctive vertical profile of trends. With increasing greenhouse gas concentrations, the surface and troposphere are consistently projected to warm, with an enhancement of that warming in the tropical upper troposphere. Hence, attempts to detect this distinct ‘fingerprint’ have been a focus for observational studies. The topic acquired heightened importance following the 1990 publication of an analysis of satellite data which challenged the reality of the projected tropospheric warming. This review documents the evolution over the last four decades of understanding of tropospheric temperature trends and their likely causes. Particular focus is given to the difficulty of producing homogenized datasets, with which to derive trends, from both radiosonde and satellite observing systems, because of the many systematic changes over time. The value of multiple independent analyses is demonstrated. Paralleling developments in observational datasets, increased computer power and improved understanding of climate forcing mechanisms have led to refined estimates of temperature trends from a wide range of climate models and a better understanding of internal variability. It is concluded that there is no reasonable evidence of a fundamental disagreement between tropospheric temperature trends from models and observations when uncertainties in both are treated comprehensively. I am so surprised that I don’t see on any climate blog site, including WUWT, the development of maxima and minima in tandem with the reported average temperatures on earth. Average temps. do not tell you anything at all. You have to see what it causing the average temps. to rise or fall? That thing that we argued last time, namely your reason why I see no warming in the SH, does not work out for me. I analysed a weather station on an island in the caribean (Hato), and here too I see the same pattern as I see on other islands like Easter Island and Marion Island: it is maxima increasing, pushing up the mean average temps. Hawaii was maybe the wrong island for me to chose as it is volcanic. The only explanation I can see for the results that I am getting is that there is a correlation between the extra heat being trapped (or not) and the increasing greening of earth (or not, or de-forestation).